Well said Sandra. We don’t really get away with anything in life do we, however much we might want to believe that we do – something will always reflect back to us what is going on – if we are open to ‘looking in the mirror’. Looks like a great space now. I trust you will fill it with real people now, not just ‘cyber-men’! Very beautiful sharing Sandra, thank you. It really teaches how a certain situation we are in can be caused by a choice we made long long ago, so it is wise to not judge ourselves but look at what might have caused a situation to be the way it is. Holding onto hurts clouds our perception of situations and connection with others. I’ve found if left unresolved hurts fester away, many times unbeknowningly affecting all parts of our lives. I love how you looked deeper into what your relationship with the outside area was, and what had been allowed to get in the way. Very inspiring Sandra, there are definitely a few areas for us to look at and claim back. What a beautiful courtyard with an outlook to a park. What a beautiful place to live. This is gorgeous Sandra and knowing you as the playful Women you are I am graced by your experience and I get to see and feel you even more than before. What a great sharing. I agree Golnaz. It is like by withdrawing from life – and be it ‘just aspects of it – we move back into shadow and undernourishment. And so we hold back our natural unfolding and blossoming. I love what you’ve shared here Sandra about the whole process taking triple the amount of time you expected it to. When we’ve given up on ourselves, or any area of our life, it takes time to build the steps back to re-connection. As much as we might want there to be, in the end we learn that there are no quick fixes. That the only way back to ourselves is to see the mud clearly for all it is – stuff that doesn’t belong but needs to be dealt with – and start putting in the work to clear it away. The whole process takes a while, and we can sometimes forget why we’re clearing away the mud when we’re covered in it.. but slowly it starts to shift, and the joy and steadiness we start to feel as it does is so so worth it. 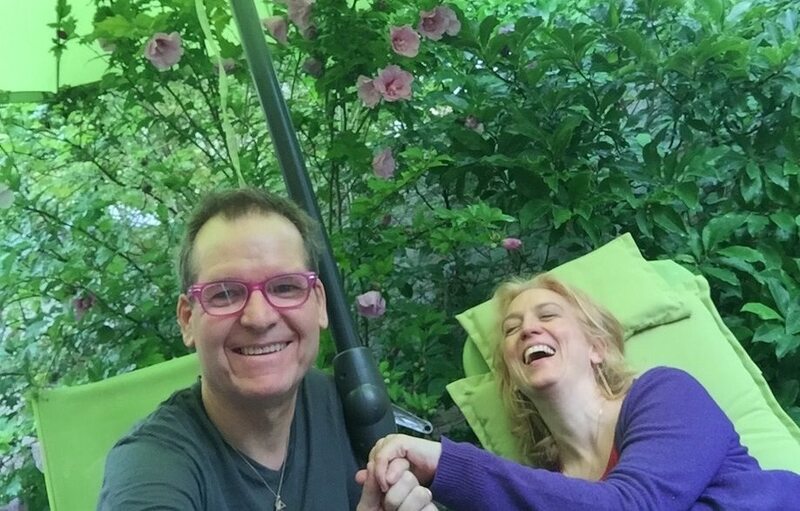 Sandra, I enjoyed reading your story about how the state of your courtyard reflected to you and your partner about a hurt that had not been fully healed. It is so beautiful how our surroundings can reflect to us exactly what needs our attention in life that is when we are humble enough to receive the message. Enjoy your lovely courtyard, it reflects the loving care that it has been restored with. ‘I realise how much we are made to connect and celebrate our connection. The moment I withdrew from someone and/or life – I am in fact withdrawn from my natural way of being.’ – Beautiful Sandra, I can very much relate to what you are sharing. Withdrawal has been a big part of my life, in fact I saw it as a necessity to ‘survive’ in the world… little did I know that the more I withdrew the more ailien and awkward I would feel. Thanks to Serge Benhayon and his life changing teachings, I have realised that the only thing that will ever make me feel ‘at home’ in the world, is if I choose to truly connect to myself and everyone else equally, i.e. let them see who I am. ‘Withdrawal has been a big part of my life, in fact I saw it as a necessity to ‘survive’ in the world’. Yes this been my habit too Eva, and just recently this going into survival mode has come up again for me to truly heal and choose differently and that is to choose trust and to stay with myself in other words to stay present and in my body. Work in progress it is but slowly and surely, I find I am tapping into my playfulness as lately I can feel that I had went into serious mode! Yes. We are the ones who bring the difference into the world. If I sit at home and wait that the world will change so I can trust it to get out there…I will wait forever. Who shall bring the changes if not we?! This is the beauty of taking responsibility. It is not that I can wait for my anxiety to go and then I will move – I move, and anxiety will melt. This shows that everything is connected and that that what happens in one area of our life has an influence on all areas of our life. Hear hear Esther – so true, everything is connected and the ripples of our actions travel wide. Our homes are such a learning point for how we live. Thank you for sharing another part of our homes that can often be ignored or not seen as important as the main living area. Your renovations were a reminder of how we need to dig deeper to get to the root cause that often gets buried over years when it comes to the disconnections and hurt that we can carry. I love how you have taken the serious topic of hurt in relationships and reflected in such a lighthearted way. it makes healing only but one choice away! Gorgeous blog. Thank you for sharing the joy of opening up and reclaiming your connection with yourself and others. We all benefit from connecting and dealing with our every unresolved hurt. ‘but because we as humans are made to develop, we felt the missing growth and so here we are.’ I love this Sandra. When we close down to evolving we stagnate and therefore a whole host of complications creep in. Gorgeous that you were able to use your courtyard as a reflection for the deeper issue at hand and be open to what it was showing you. I love what you share, thank you so much; how we behave with one set of people affects how we behave with every other person, including our closest ones. I find this makes total sense, but is not commonly realised in full as yet. The story shows how, if we choose to see everything as a reflection, how much the world around us reflects back to us, for us to see, if we so choose. 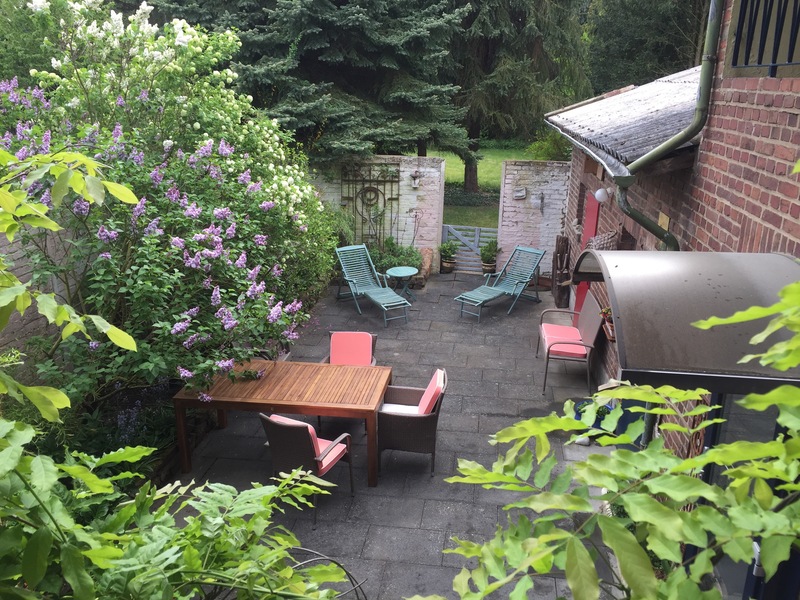 The pictures of the courtyard – and of you two – are very lovely indeed. Sandra this highlights how if we don’t deal with what comes up for us in full – then it can hang around to express itself in other ways later on. Wow what amazing support you guys had to face the hurts you had not let go of. That is such a healing for yourselves and your relationship, and the new claimed courtyard is a reflection of this. It shows me to not hold onto anything and to keep talking about where I am at with my partner. You have opened a conversation here Sandra that is giving me the space to reflect on my own ways of shielding myself from my hurts. I can particularly feel how doing this is a very different feeling in my body to how I feel when I am with myself and open to whatever comes. Thank you. Sandra, thank you for this beautiful reflection. Withdrawing is like shutting down or cutting off the oxygen supply and what results is that things start to die. I agree that this is not our natural way, we are born to Iive in unity, to be unified and when that is the case we thrive – much like your garden. ‘the result is that things start to die’ – yes Christine, they die. Courtyards, parts of houses, the garage, the garden, finances, relationships – they die. But dying is not an end. All is energy and so nothing can really totally go away or vanish. So the energy of ‘withdrawing’ does in fact put things and relationships into disgrace and this energy does stay or get worse till I change it again. We see this with the world today. We think we can leave the rubbish we are responsible for deep in the earth, in other countries or just that we throw it out of the window, but in fact the energy of responsibility for our rubbish does not leave us. We can’t throw this away, can’t get away from it. We have to take it – sooner or later. That’s the only choice we have. “And our surroundings did reflect our way of being.” This is so so true as if I look at the way I used to keep my house compared to how I do now it is very different and is simply a refection of my own development. However what I have seen from reading this and had previously been trying to ignore is the last 2 houses I have lived in I have not got on top of the garden and it has bothered me but have found it hard to change. Now I am left asking what is going on in me that is blocking these steps? So thank you Sandra, awesome. When we withdraw from a certain area of life, what is underneath, what is there to feel? Questions I will take away with me after reading this as I know there are areas in my life I have withdrawn from. Thank you Sandra. Yeah, it is fascinating how the things we hold on to and the disorder we create is present and does stand between us and another person, creating separation. And thereby we are longing for connection…. It is fascinating to me to observe how our living environment is a direct reflection of our relationship with ourselves and therefore with others. Also what you’ve shared about your hurts and how that affected your relationship, this is very supportive for me to read. I recognise this in my life too and can see so clearly what is playing out with some of my relationships. Brilliant blog Sandra, I found it very inspiring and a beautiful read. Thank you! And I love the new courtyard make-over. We think we can close down from some people in life and be open to others. But energetically that is never possible. When we hold onto things between ourselves and our partner it is also alive between us and a group and vica versa. It is all the same. They get all the same level of love or not. It is how much our heart is open to love. 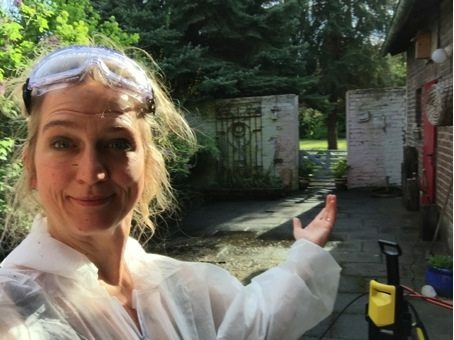 What a beautiful sharing Sandra and what a beautiful transformation of your courtyard! If your courtyard is a refection of your relationship then the stunning-ness of your connection is clear to see. It is astounding of how our un-dealt with hurts can manifest in other pockets of our lives without us joining the dots. I love your sharing Sandra. It is interesting how our outer surroundings can reflect our inner stillness – or turmoil…… and we can never truly bury issues. Beautiful honest story Sandra – thank you for sharing. It shows how much one thing affects another – deeply so. And, that by choosing to be aware of what is in the way anything and everything can change. The awareness is key isn’t it Jane – with that awareness can come the next movement towards the change we know and feel has been waiting there for us. Yes Jane. And it shows that the true way of being is beautiful and full of grace. Every mess we live in on this planet is a disgrace, in fact it is an act against divinity. Once again a powerful read on how everything is connected and there that is always room to bring more and be more in our lives when we let go of the hurt and move on to the quality of living that we know can bring us joy. Well said Jane Keep! Who would have thought that the state of ones garden was a direct link to another area of their life that was hiding a hurt. A great sharing of what is possible to heal when we look deep into ourselves and honestly reflect how we are living. Sandra, I love the joy I can feel reading your story doing a practical thing like cleaning up your courtyard. I also can often wish there is someone else to sort out some mess in my house or garden, rather than do it myself. But when we start, it actually doesn’t take that long to make it feel very lovely. It gives you a gorgeous space to enjoy together as you both grow in your relationship. Because everything is everything we cannot have one little pocket of un-dealt with stuff without this affecting every other part of the rest of our lives, and this article is a brilliant example of this. This is such a relatable and practical sharing of how when we withdraw in one area it affects all others, and to have such an area like your courtyard show this is great. When we close off in one area over time we close off in other areas even ones where we do not want to close off, so what I also learn today is to be open to the world, and to address those areas where I’m not. And finally to allow the grace for this to change, that it may not happen overnight but will take time and to use that time to unpick and clear out anything which is not about being open and embracing the world. Thank you Sandra, this is a great sharing to take into my day and life. What I learned here Monica is that life is designed out of pure and true love. All is connected and so reflecting me my choices and way of living and so, support me to learn and unfold. I am held in love all of the time – I do not have to ‘bring love’ or ‘make it right’, just to surrender to what is there already. In me and around me. Sandra, I love this article, ‘And our surroundings did reflect our way of being.’ I can feel how true this is, when I’m feeling myself – open and loving then I notice how my surroundings are and I feel impulsed to clear and make them feel ordered and supportive, when I’m feeling caught up in issues and not feeling great I notice how my surroundings reflect this, that I let the house go, it becomes messy and disorganized much like how I am feeling, so yes I can feel how our houses and gardens are a reflection of how we are. You can really feel the difference in the two photos. I love this because it is something I have been asking myself over the last few days, what is there hiding that I have not dealt with? As I have been really aware of a feeling in the right side of my body telling me this. I guess we only start to feel/see unresolved hurts and things like this when we are willing and ready to! It also shows how the inside reflects the outside, which says a lot about us as humanity and the state of the world currently. Every change like this is a ripple and another reflection to the world for more true healing to take place. Wow what a fascinating tale of hurts and shields being reflected in the disregard of your courtyard, the place to connect to the outside world. Love it! What a great sharing and so useful to then to look at what my home is reflecting back to me, especially this area you describe as ours is also quite shabby. ‘I realise how much we are made to connect and celebrate our connection. The moment I withdrew from someone and/or life – I am in fact withdrawn from my natural way of being.’ – Yes and in our drawing back in one aspect of life we are in fact withdraw in all aspects, nothing is isolated. – love the new courtyard! This reminds me of how we have to be constantly aware of whether we are truly celebrating another, or pulling back in any way, as everything is being registered. Sandra what is amazing about your sharing is how it shows that everything is connected to everything else, from one experience that affected your relationships not only with your partner but also an area of your home. As you chose not to shut down but open up in one area it opened up all areas. Simple yet incredibly powerful and something that shows we can’t live in parts and think we are truly living. Yeah. We may try to sweep the one or other thing under the carpet, but this carpet is the foundation we stay on…or fall down to when the ground becomes to disharmonic…. A few weeks ago on a Monday I was feeling utterly exhausted and luckily enough I had a session with a great practitioner booked. When I shared how unwell I felt, he said “what happened at the weekend?” I started to share a phone call I had had at the weekend and burst into tears. I had not realised how much this apparently insignificant incident had upset me – in fact I hadn’t even realised it had upset me and yet here I was carrying a huge hurt that was exhausting me. As soon as I expressed it, it was gone. It is something of a miracle to me that I can still at times carry around a hurt like that without even realising it, just as you describe here, and it is exhausting! Great how you describe this Nicola! Yes, we carry a hurt and it takes some energy and space from us, leads us to us exhaustion and limitation. Being not aware of this interplay is dangerous and makes us disempowered. How great to have some reflections around which support us in ‘take a look!’. It is interesting to observe the pockets in our life where we let go of things. Often we think that these things do not affect us, but given that everything is energy, everything counts. I can feel the whole of my shared flat within my body. When one room is not attended to or loved, I can feel how much it affects the whole home. What this reminds me of is that everything requires an equal amount of attention. Thank you Sandra. It is such a good point that if we withdraw from one area in our lives we withdraw from life. There can be no pockets left unattended to, and if this is the case it is a great reflection for us to take a look at what is going on. Wow Sandra this is beautiful and so reflective I really love and appreciate your sharing and smile. The joy, commitment and hard work of clearing up reviving places and claiming back every little detail and hidden place is something I love too and have spent my life with and the sharing of this with others and this beautiful sharing from you from a deep knowing of you, is really very precious to read and offers huge appreciation, love and so much more to ponder on for all. Thank you. Oh yes Tricia, you do that ‘professional’ ! And I can see the healing that is brought to a place by clearing and appreciating it – bring it to full bloom so to speak – and so this healing is offered to the humans who live in it. When we hold onto our hurts, we contract and withdraw from life constricting ourselves by way of how we move (sleep, eat, converse, think, act etc.) so that the whole geometry of us is changed and before we are even aware, we are moving in such a way that creates angles that do not support the expression of our true selves. Dealing with these hurts creates space, for we are allowing ourselves to release that which does not truly belong to us. With this space comes grace – the freedom to breathe our own breath once again. This is a great sharing of this process Sandra and I love the photos….ahhh. Liane I love your analogy with geometry. Holding on to our hurts makes us thorny and spiky with many angles that cannot attract, love or show openness to other people. It is a powerful image that I ‘ll keep at the forefront in my mind. I haven’t read blogs in a while but finding this one and your comment truly made my day. A big thank you. Your great sharing Liane has supported me to understand the reason why emotions are so harmful for our bodies. All emotions cause physical contraction. Even happiness is a form of contraction. A contracted body then pulls in contracted thoughts, which in turn lead to a contracted body and so it repeats and repeats, continually blocking our access to the truth. What is so incredible is that this can occur at such a subtle level, in highly aware people. It shows how familiar we are with being awkward and restricted in our movements, and how easily we accept a geometry that constricts and constrains us. Hence how important it is that we take this seriously and value everything that is happening in our lives and not trivialise a single thing. If Sandra had not paid attention to her courtyard, not only would it have stayed a barren and empty place, that barrenness would have remained and could have spread like slow seeping poison in her relationship. It is by this means that so many relationships end up at lonely and distant destinations that bear no relationship to the deep love they felt for each other at the start. The analogy of tending our relationships as we would a garden (or a courtyard) is an old one, and true. This care can not be superficial or tokenistic, rather if we want our love to flourish, we must dig deep into the soil and feed it with our care, respect and the richness of our presence. This is how we flourish in our partnerships. Great Sharing Sandra. It so important to really look at everything life is showing us, as if we bury 1 hurt then it can still affect everything else we do. Amazing to see your relationship with your courtyard and how that has changed and is now flourishing. It would be worth observing how we feel when going to different places and asking why we have those thoughts like “I’m too busy, I don’t want the insects” etc as it could change our life.